These kid-friendly kitchen tasks are the perfect way to get your littles cooking with you without the stress or mess. Getting kids involved can be a daunting prospect. Figuring out what kids can actually help with versus what will be more of a danger, bother, or huge mess is hard. I am a firm believer that kids can get involved in the kitchen from as young as 1.5. It’s all about finding simple kitchen jobs for kids that you feel comfortable giving them. If the idea of getting your kids in the kitchen makes you a little queasy, hear me out. I’m here today to show you some really simple kid-friendly kitchen tasks that work for kids of all ages. Choose one to do tonight while you’re making dinner. Kids in the kitchen doesn’t have to be a huge all or nothing thing. You don’t have to have the involved in every single part of every recipe. 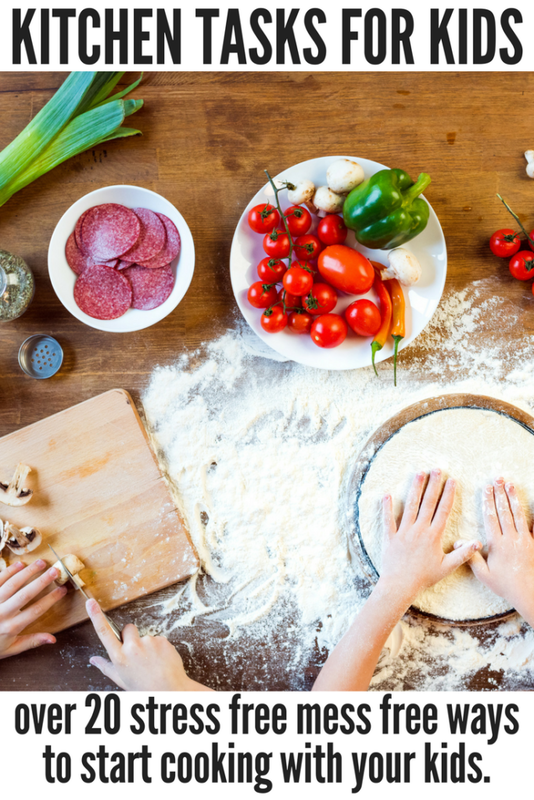 Get your feet wet with these small cooking tasks for kids. My 2 year old LOVES this task. This works well for veggies that need seasoning or anything that needs marinating or breading. Add all of your seasoning ingredients into a large zip-top bag. Next, add your prepped veggies, potatoes, meat – whatever. Finally, close the bag and let your kid shake to their little hearts content. Tip: If you think your kids will get overzealous, fold over and tape the bag to ensure they stay shut. Make it work for older kids. Try having them toss things by hand on the baking sheet you’ll be making them. This works great for things like roasted veggies or baked french fries. Add the veggies and seasoning and drizzle with oil before letting them go at it. I think this is every kid’s favorite job. Stirring ingredients together is a fun and simple way to get your kids involved. Make sure what they are stirring is cooled. Also, that they know the kitchen rules regarding sneaking a taste of what they are making. Got a recipe that calls for a specific number of ingredients? Pull up a stool and have your kids help with the prep. Count out and organize your ingredients. Maybe a soup calls for 4 cloves of garlic, 2 carrots, a stalk of celery and 7 mushrooms. This is a super easy way to help hone your kid’s counting and organizing skills. In addition, it can introduce them to the ingredients in a meal without stress. Finally, it can get them involved in what I consider the most low key way. If you’re doing something that requires repetitive layers or some kind of assembly, kids will love helping. Maybe they can hand you the next ingredient when you’re making a layered lasagna. Or, maybe you can guide them through making a few sandwiches for a family picnic. Greens are not usually a kid favorite. But, if you serving the greens means they can jump in the kitchen, they’ll see it in a new light. Have kids tear up greens and lettuces for a salad or remove herbs from the stems. Not only is this a chance to pawn off a prep task you might not love – hello, peeling garlic! – but it’s a great way to get kids invested in the foods they are making. For example, let’s say their prep job is to destem mushrooms. Studies show children will feel invested in the dish those mushrooms will be in. In turn, they will be more likely to try and enjoy it. Destemming mushrooms and wiping them with a damp paper towel to clean. Removing herbs from the stems. Peeling fruit such as oranges. Adding toppings for things like tacos or baked potato bars into their own bowls. Get a pastry brush and task your kids with brushing on egg wash or melted butter. The normal bristle ones are much more kid friendly than the silicone ones. Even without anything to actually mash, my kids love playing with the potato masher. This task is a no brainer! Make sure that either you are keeping a very close eye on them. You can also make sure that they aren’t working with a super hot item. Mashing fruit for desserts like these healthy banana cookies is a perfect, danger free option. If your recipe calls for using lemon, lime, or other citrus fruit, this is a great task for kids. But, we’re not going to have them squeeze the fruit directly or using a juicer. Instead, grab a small plastic baggie and place the cut fruit inside. Remove the air and close the bag and ask your kiddo to squeeze the fruit to release the juice. This makes sure that they won’t get any acidic juice into cuts on their hands or in their eyes. Bonus, you won’t have to deal with finding seeds in your food. Tip: Make sure you roll your fruit well to release juice ahead of time before cutting. Also, try microwaving the whole fruit for anywhere from 5-10 seconds to loosen everything up a bit. Making cookies with kids is fun! Constantly arguing with your kids about what tasks are okay for them is not. In the past when making cookies with my oldest, I’ve laid out “his” tasks well ahead of time. This might mean I make and chill the batter while he’s napping or at school. I like to have it all rolled out and ready for cookie cutters for when he gets home. Using cookie cutters is another task all kids love! 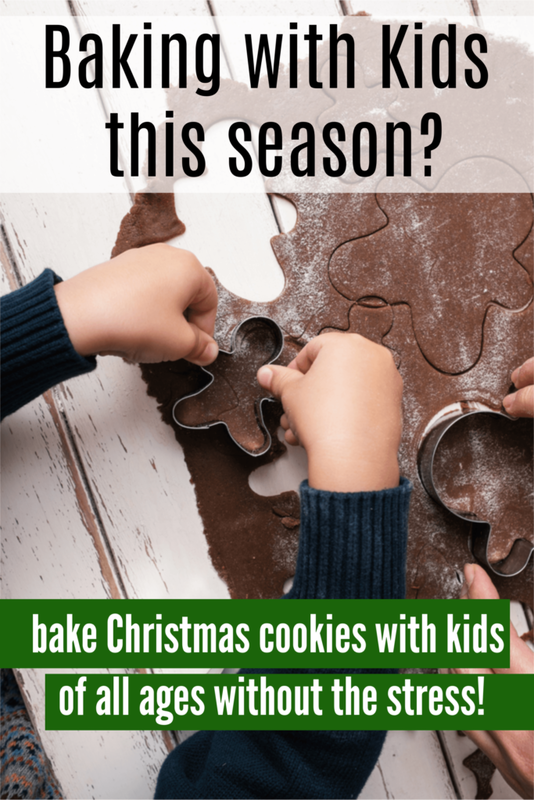 Check out my post on Christmas Cookies your kids can help make with you – it gives simple tasks from each recipe that your kids can easily assist with. If you’re looking to bake with your kids this holiday season, here are some tasks that would be a great fit! Another dreaded task that kids might love is washing produce. This can mean putting fruit into a colander and letting them rinse and shake it about. Or try asking your sous chef to use the scrub brush to clean the potatoes. Using the salad spinner has a few benefits for kids. 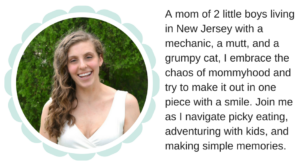 First, it’s crazy fun for littles. Next, it’s stupid easy, so little to no guidance or oversight is needed. Put the greens in the spinner after washing and let them press the button to their little hearts desire. Again, you’re giving them ownership of an aspect of the dish that they might not normally eat with gusto. Salad is a difficult meal to convince kids is delicious. Giving them a hand in creating it is a great way to get kids invested in the salad aspect. From prepping the produce to tossing the salad to shaking the dressing or even just choosing which dressing to use. Depending on your kid’s age, chances are you don’t want them measuring out olive oil for you. A good alternative is you pouring and they can tell you ‘stop’ when you get to the right measurement. Show your kid the line needed to hit for your liquid measurement. Explain what it means and have them ‘measure’ it out for you. Another simple way to measure is fresh ingredients. If a recipe calls for 1 cup of packed fresh spinach, that’s a great one for kids to do themselves. Making cookies? Give your kids a spoon and let them measure and roll the dough into balls. Older kids who you can trust with hands not going in mouths, can also have them roll meatballs. Tip: use a spring loaded cookie scoop to get even sized balls. Kids love using the scoop and you’ll love not having to make sure all are the same size. Ask your kids to give you a hand when setting the table. Teaching them how to do it while young will ensure you’re not doing forever. Who doesn’t love whisking? If you’re making scrambled eggs, crack them into a bowl and let your kids do the whisking. Same goes for a vinaigrette! Okay so tell me – which do you want to do with your kids first? If you do one of these tasks with your kids, I’d love if you’d post it on Instagram Stories! Make sure you tag me @morganmanages and use the hashtag #fearlesskidscooking so I can see!